This gallery was created only as a reference library for those interested in Arabian horse history. Photo credit will be given if possible, unfortunately some are unknown. If you would like to have a photo placed on this page please email me! If a you see a photo/horse on this page and would like if removed please notify me. Last Update: 06/26/01 - 182 horses! 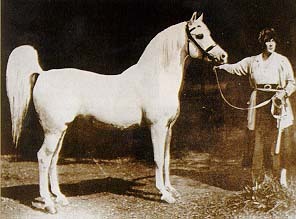 owned by Arabian Horse Archive.